Wingerworth Wobble is a 4.5-mile trail race with approximately 200m of ascent, taking in a clockwise loop near Wingerworth in Derbyshire. It’s organised by the eponymous Wingerworth Wobblers. The 2019 winner, in 30 minutes exactly, was Daniel Preece of Hadleigh Hares. First female was Hannah Barnett of North Derbyshire, in 36:11. 106 runners finished the race. 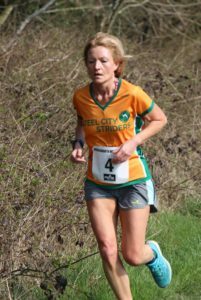 Sole Strider (and third female overall) was Sarah Allcard.